There are so many great air fryers out there that cook up deliciously crispy food with a fraction of the calories of traditional deep frying. Instead fo using batters and high-fat oil to fry up foods, these devices use nothing but hot air. 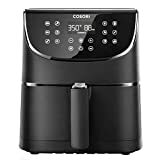 If you’re finally ready to check one out and you’re not sure which model to choose, our new favorite model is the COSORI Touchscreen Electric Hot Air Fryer. It has 11 different presets for all sorts of popular foods, so frying them is as easy as pushing a button. On top of that, it comes with a free cookbook packed with 100 recipes! 100 RECIPES COOKBOOK – Enjoy your favorite fried foods with 100 original, delicious & easy recipes for every meals. Find out how our numerous influencers cook their food with Cosori electric air fryer in social medias and our community!